A Soyuz rocket blasted off from the plains of Kazakhstan Tuesday with the International Space Station's newest addition, a module doubling as a docking port for visiting spacecraft and an airlock for spacewalking astronauts. The 168-foot-tall booster roared away from Launch Pad No. 1 at the Baikonur Cosmodrome at 1422 GMT (9:22 a.m. EST) Tuesday, or just after nightfall Tuesday night in Kazakhstan. The venerable Soyuz, flying for the 1,750th time in its various configurations, launched into mostly clear skies, fading from view of ground cameras as it shed four strap-on boosters. The three-stage rocket delivered its payload, the Poisk docking compartment, to a low-altitude injection orbit about nine minutes after liftoff. 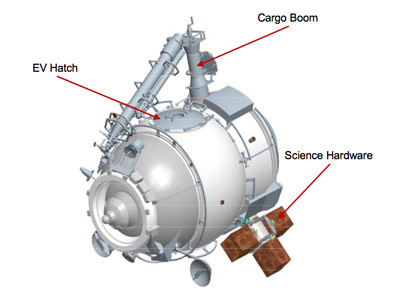 Poisk, which means "search" or "explore" in Russian, is attached to the service module of a Russian Progress resupply ship, providing electrical power and propulsion for the spacecraft during its two-day journey to the space station. 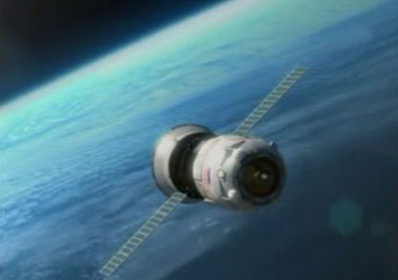 The Progress will fire its engines twice later Tuesday to begin changing its orbit to chase down the complex in space. More burns are on tap Wednesday and early Thursday before the ship begins its automated final approach to the outpost on a Kurs rendezvous radar system. The automatic sequence should begin at 1320 GMT (8:20 a.m. EST) Thursday, leading to a docking with the Zvezda service module's space-facing, or zenith, port at 1543 GMT (10:43 a.m. EST). The new module is the first major Russian addition to the complex since the nearly identical Pirs module was launched in 2001. Pirs is located on Zvezda's Earth-facing port, directly across from the future home of Poisk. Poisk will give the station a fourth docking port on the Russian segment, allowing for longer stays of future Progress freighters and more opportunities for crew handovers using Soyuz spacecraft. "This zenith port on ISS today has what's referred to as a hybrid port," said Mike Suffredini, NASA's space station program manager. "It's ready to accept this particular vehicle and once it docks, the Progress bus portion of it will depart and what's left is a standard probe and cone port. That will allow us then to have a fourth docking port on the Russian segment." Today, the Russian segment features three docking ports: one on the rear end of Zvezda, a location on the Pirs module, and another on the bottom of the Zarya module. The compact egg-shaped Poisk module measures about 13 feet long and 8 feet in diameter at its widest point. Poisk weighs about 8,000 pounds, according to NASA. Future Russian spacewalks will use Poisk as an airlock. The module also carries electrical and data interfaces for experiments to be mounted to Poisk's exterior. Poisk's internal volume measures about 500 cubic feet and the module includes two egress hatches for spacewalking astronauts. Also called Mini-Research Module 2, Poisk is carrying about 2,000 pounds of equipment inside its pressurized section, including Russian Orlan spacesuits and life support equipment, according to NASA. The Progress space tug will be jettisoned from Poisk after it arrives at the station. Poisk was built by Energia, a Russian aerospace giant with heavy involvement in the station program. Energia is also finishing construction of a longer, heftier version of Poisk called Mini-Research Module 1. That component will be launched aboard the space shuttle next May and placed on the Zarya module to provide clearance between docking ports on the Russian and U.S. segments.